1. Bobbi Brown Tinted Moisturising Balm. // 2. Topshop Saint Lipstick. // 3. ASOS Smock Dress. // 4. Anthropologie Dachshund Letter Holder. // 5. Urban Outfitters Bunny Ring Holder. // 6. Chanel Spring Collection Illuminating Powder. // 7. Hunter Original Gloss Wellington Boots. // 8. Pandora Silver Turtle Doves charm & Pandora Red Pave Heart charm. 1. The Bobbi Brown Tinted Moisturising Balm is something I've been hearing a lot about for a little while and I really want to try it. My skin is SO dry at the moment, sometimes I haven't been able to wear make up at all because it just looks awful but £34 is a lot of pennies to part with for something I've not ever seen in person. I think I need to try and get a sample. 2. I haven't really seen many reviews of Topshop Saint lipstick but the pictures online look super pretty even though I think it would wash me out a lot. I'm a huge fan of Topshop make up, especially their lipsticks and I kind of feel like I almost want to collect every shade. Someone tell me no, please? That's so silly! 3. Comfy clothes are my absolute favourite and this smock dress from ASOS looks like it's the epitome of comfort. I like that this has a fitted high waist because I find that usually these kinds of dresses have a drop waist which is one of the most unflattering things for my body type. I'm all about the high waists! 4. Having an entire house to decorate can often feel like a super overwhelming and daunting task. Paint colours, curtain patterns and big furniture items are a nightmare to choose if you're as indecisive as we are but little things like this are SO easy and I'm sure I'm becoming addicted to buying little knick-knacks. This little Anthropologie Dachshund letter holder is so adorable and actually quite practical too. Bonus. 5. I have seen a lot of bunny ring holders around recently but this one from Urban Outfitters has really caught my eye because of the beautiful blue shade. It would look so adorable on our side table that I'm on a mission to fill with cute & personal things. 6. Looking at the new Chanel Spring make up collection was a huge mistake because now I want pretty much everything. A new highlighter is something I definitely don't need but just look at this highlighter. It's stunning! 7. I've lived in the country side for almost two years now and I still don't own a pair of wellies. I keep putting off buying a pair for reasons even I can't understand so I should probably buy some cheap ones to see if I even like them but I can't help but lust over a pair of Hunter boots! 8. The Pandora Valentine 2013 collection is so sweet, I feel like they always get it so right with their collections and this one is no exception. The two charms that have especially caught my eye are the Silver Turtle Doves which is effortlessly adorable & the Red Pave Heart which is super sparkly and girly. What's on your lust list this month? Lovely picks, Jennie! The bunny ring holder is gorgeous! Thought we would see a pair of Hunters on here! ;) Really like the smock dress, nice and comfy and I am all about comfort in this brrrr weather! 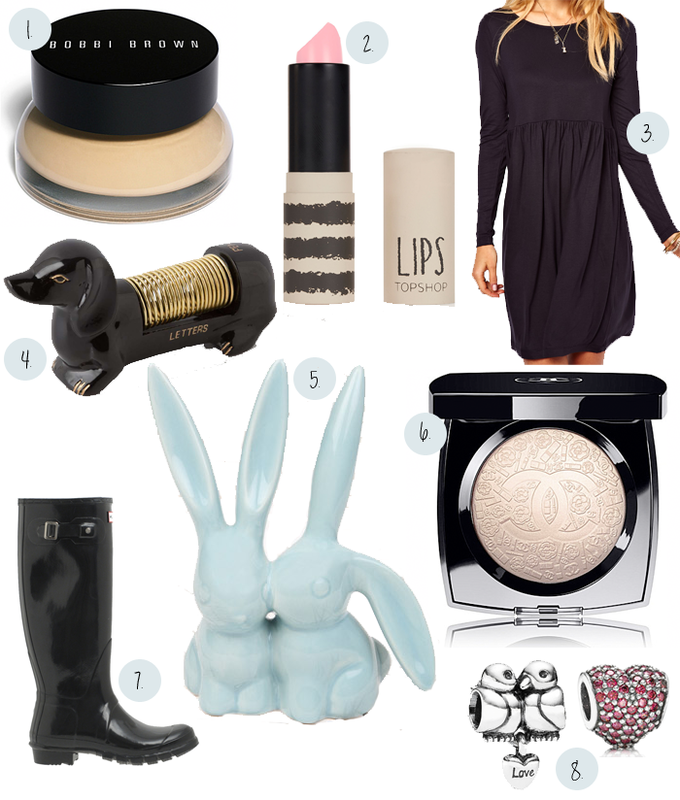 Great January wishlist picks! I especially adore the Anthropologie letter holder (so cute) and the ASOS smock dress - it looks like the perfect post Christmas dress. I love the ASOS smock, it looks so cosy and perfect for this weather. That lipstick looks sooo pretty. I also love that dress. And I totally agree, wellies are essential in this weather!! The ASOS dress looks so easygoing and comfortable! I've heard great things about the Bobbie Brown tinted moisturizing balm too. And that cute letter holder... oh my goodness, if I had that I would probably be persuaded to write more letters! Aww, how cute is that ring holder! Go buy it now, Jennie!!! Love your wishlists Jennie! I've been lusting over a pair of teal Hunters myself! I've never owned a pair of hunter wellies but it seems a lot of money to spend when i used wellies for walking the dogs. They are always covered in sand or mud. I got a pair of Dunlop wellies about 4 and half years ago and they were £11, only got a small crack in the heel now. They have only not been worn when it's too hot, which hasn't happened very often this year. I would recommend looking some Dunlops ones up. That letter holder is the cutest! I need to invest in something like that. I'm always finding letters everywhere in the house! You know something....Topshop lipsticks should come with a warning like a pringles advert: once you pop, you just can't stop. I find myself wanting them all. Addictive. I've recently purchased Saint myself. I think Lily did a review on her etcllymlrs blog. I've not been lusting after much this month.